“It’s a serious job,” I added. “Yes, it is,” he said. 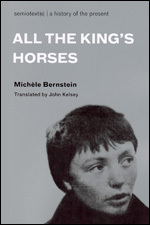 Michèle Bernstein’s novel, All the King’s Horses (1960), is one of the odder and more elusive, entertaining, and revealing documents of the Situationist International. At the instigation of her first husband, Guy Debord, Bernstein agreed to write a potboiler to help swell the Situationist International’s coffers. When she objected to the idea of practicing a “dead art,” Debord suggested that it would be instead be détournement—the Situationist reuse of media toward different, subversive, ends. Inspired by the pseudo-scandalous success of Roger Vadim’s filmed version of Choderlos de Laclos’s Les Liaisons dangereuses and the adolescent Françoise Sagan’s bestselling novel Bonjour tristesse, Bernstein lampooned and borrowed from both Sagan and de Laclos, concocting a roman à clef that succeeded on several levels. A moneymaker for the most radical front of the French avant-garde, the novel (by its very success) demonstrated the bankruptcy of contemporary French letters and the Situationist contempt for the psychological novel, while (perhaps unintentionally) holding up a playful mirror to the private lives of two of the Situationist International’s most important members. All the King’s Horses is a slippery rewrite of Dangerous Liaisons with Debord playing the role of cold libertine, Bernstein as his cohort, and disguised walk-on roles by the likes of the painter Asger Jorn and others. Though Greil Marcus sparked interest in this novel in his 1989 book Lipstick Traces, All the King’s Horses remained unavailable until its 2004 republication in France. This Semiotext(e) edition is its first translation into English. Michèle Bernstein was a founding member of the Situationist International with her first husband Guy Debord. After the end of the SI, she became a literary critic for the French left-wing magazine Libération.